Q. How did you hear of the Toronto Dingos? A. Tommy Bell and Ben Oryall kept telling me I should play. Q. 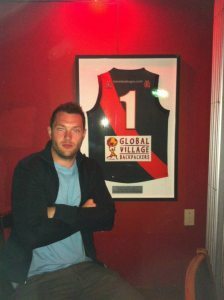 What sport did you play prior to Aussie Rules? Q. How do you find the cross over, what is difficult/easy? A. The general aspects of the game aren't too difficult to pick up (i.e. tackling, kicking, passing). The positioning and game IQ is a bit more difficult to grasp. The post game/practice beers are pretty similar...so that's cool with me. Q. What do you like best about the game? A. I like the competition on the field and how fired up the boys get during the game. Also, the tackling and kicking is pretty great...I was never allowed to kick in other sports. Q. You were made 'Best on Ground' for the Swans match in Ottawa! How did that feel? A. To be honest, I was pretty surprised. But regardless, it's still a pretty cool feeling to be acknowledged for my play in only my third time playing the game. I thought that everybody contributed pretty evenly that game, the boys had to dig deep to pull it out. I'm just happy we sneaked by with the win. Q. What are your favourite things about being a Dingo? A. I like being a bud with a bunch of beauties. The atmosphere amongst the team is awesome. Everyone shows up ready to play, and wants the win for the whole team. Q. What are your goals for the season? A. I'd like to learn the game better and make more of an impact come game time. I also don't really know what this grand final flag looks like...but I want one. Q. Who is your favourite Dingo and why? A. I feel like I should put down Shauny McKay based on the fact that he's probably on suicide watch after that collapse by the Bruins in game 6. Cheer up boy-o. Jimmy and Gaz have a work ethic for days on the field. I dig it. But in all seriousness, all the dingo's are great. Q. Best moment with the club so far?